Angiography is a type of medical examination that images blood vessels in various parts of the body, including the heart, brain, lungs, kidneys, arms and legs.Corvallis Radiology physicians conduct all three angiographic examinations – catheter, MRI and CT angiography. Each has its own specific situational uses. Catheter angiography is a minimally invasive medical procedure that images blood vessels and is considered to be the “gold standard” for vascular diagnosis. After passing a catheter through an artery leading to the body area of interest, contrast material is injected to highlight the vessels when x-rays are taken. This examination is widely used in patients who may undergo surgery, angioplasty and/or stent placement. Visit our interventional radiology page to learn more. For other patients, many catheter angiographic studies have been replaced by the less invasive CT and MRI methods for examinations where an arterial catheter is not required. During a CT angiography (CTA) examination, rotating x-rays are passed through the area of interest in the patient’s body from several different angles to create cross-sectional images, which then are assembled by computer into a three-dimensional picture of the body area. Contrast material is also used in CTA, though much smaller needles are used to inject the material into smaller peripheral veins. 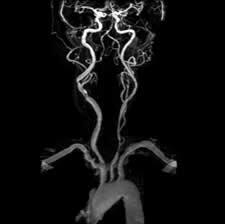 Most patients undergo CT angiography without being admitted to a hospital. CTA is used to screen large numbers of individuals for arterial disease. Other uses of this examination include the detection of aneurysms, embolisms and dissections in arteries and other major blood vessels, as well as thrombosis (clots) in veins. 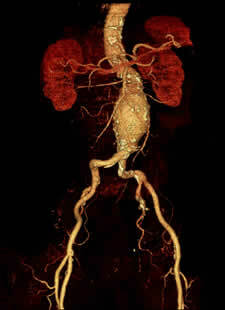 MR angiography (MRA) is an MRI study of the blood vessels. In this examination a computer measures electromagnetic energy (not x-rays as in CTA) to form two- or three-dimensional images of the body area. although a special form of contrast material may be given to make the MRI images even clearer. The procedure is painless. MRA is commonly used to detect, diagnose and aid in the treatment of numerous cardiac disorders and blood vessel diseases – including stroke. For more detailed information on this examination, visit RadiologyInfo.